Today for our Better Hearing and Speech Month Blog Hop, Speech Language Literacy Lab welcomes Molly Aceves and Ellen Magit, directors of Bilingual SolutionsINC as guest bloggers. Bilingual Solutions, Inc. is excited to be part of this “hop” and hopes to support professionals in the field who are working with bilingual, Spanish-speaking students. Developing the early literacy skills in Spanish-speaking students is one of the most effective ways of supporting their literacy growth in both Spanish and English. Research shows that students who achieve high levels of academic achievement in their native language of Spanish experience that same success upon the transition to English. The same is seen in the development of their phonological and phonemic awareness skills. “Because children often transfer skills from L1 to L2 as they learn language sequentially, their phonological awareness skills in Spanish should be predictive of their reading acquisition in Spanish as well as in English. Furthermore, helping children who receive native language instruction cultivate their phonological awareness skills in Spanish will have beneficial effects on Spanish literacy and on later literacy development in English” (Gorman and Gillam, 2003). Although we know that native language development is best practice for bilingual students, the methods of teaching literacy and phonemic awareness are different in Spanish….and rightfully so! While the oral phonology of both English and Spanish may share some similarities, there are important differences that need to keep in mind. This is critical when teaching phonemic awareness, particularly if the students are going to participate in a dual-language or bilingual experience where they will be taught to read in Spanish. “The Spanish phonology system is different than that of English. There are fewer consonant and vowel phonemes in Spanish, less complex syllable structure and longer words, and phonological development for Spanish speaking children is also different. Training of students in spelling, blending, and segmenting syllables and phonemes may be especially valuable because these skills are closely related to those which students use when actually reading and writing.” ( Dr. Nydia V. Bou Puerto Rican Spanish Phonology; a Case Study on Phonological Awareness Intervention). What's the difference of Spanish and English phonology? The most significant difference is the important emphasis that is placed on the CV syllable structure. This is the most salient feature of the Spanish language, and it is an important unit of processing on a linguistic level. As a result, when students are taught to read in Spanish, they typically are taught each of the vowel sounds, and then are taught each consonant…essentially making a series of CV syllable structures (ma, pa, ta, sa, la) that are strung together to make words. (pa + to = pato). Words are ready syllable by syllable…not sound-by-sound and not using an onset + rime structure. Developing phonemic awareness for these students should model a similar scope and sequence. We know that phonemic awareness is an essential component for early literacy development, and this is no different for students learning to read in Spanish…but how we do that needs to respect the phonological structure of the language. What does this all mean for treatment? To the extent possible, emphasize that CV syllable! For example, in English we would work on initial phoneme identification (the initial sound in duck is /d/)….in Spanish flip that to initial syllable identification (the initial syllable in pato is /pa/). In English, we would work on phoneme segmentation (duck = d – u – ck)…in Spanish flip that to syllable segmentation (pato = pa – to). Not only are these types of activities culturally and linguistically sensitive, they also support early decoding and encoding skills when learning to read in Spanish. While many of these types of activities can be created by SLPs, in response to a lack of materials available to help support early literacy development in Spanish, Bilingual Solutions, Inc. developed two products that can be used at Tier 1, Tier2, and Tier 3 through the RTI model. Conocimiento fonológico is a systematic and explicit method used to develop students’ phonological awareness skills in Spanish. It is not a translation of existing English programs, and it respects the phonological differences that exist between the English and Spanish languages, primarily the importance of emphasizing the syllable (CV) as the primary unit of processing in Spanish. Conocimiento Fonológico is a comprehensive program designed to enhance the phonological awareness skills of Spanish-speaking students. 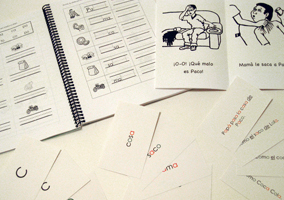 The design of the program includes research-based activities that are proven to improve both phonological awareness and literacy skills in Spanish. Conocimiento Fonológico recognizes the inherent differences between English and Spanish and maintains a connection between oral and written language. The activities are developmentally appropriate and mirror the oral language development of students in Spanish. Students learn that syllables are composed of individual phonemes, but the primary of area of concentration in Conocimiento Fonológico is the syllable. Program instruction can be used in both whole-class and small-group settings. Each of the skills is to be addressed each day of the week. Instruction typically lasts between 15-20 minutes. Visual markers are included in the book to help students to understand the concepts of first, last, beginning, ending, etc., in reference to auditory information. For more information, please visit our website www.bilingualsolutionsinc.com or email us at info@bilingualsolutionsinc.com! Molly Aceves is a bilingual speech-language pathologist, with fourteen years of experience working with bilingual, Spanish-speaking students. Her first experiences in bilingual education were in the general education classroom, where she taught both second and third grade. From there, Mrs. Aceves went on to pursue her graduate education. She received Master's degrees in both Speech-Language Pathology and Learning Disabilities from Northwestern University in Evanston, Illinois. Her specific area of interest is the connection between language and literacy. Throughout her work as a speech- language pathologist, Mrs. Aceves has focused on the development of phonological awareness in Spanish-speaking children and the remediation of language-based learning disabilities. Her work and instructional method has been presented at professional conferences nationwide. Ellen Magit is currently an independent bilingual school psychologist / intervention specialist. Her career in education has spanned 26 years, during which she has taught first grade bilingual general education and K-5 bilingual special education, as well as serving as an RtI coach. She is the author of MIDE, an assessment of Early Literacy skills for Spanish speakers, which is marketed through Aimsweb. Mrs. Magit has been particularly interested in improving literacy outcomes for Spanish speaking children in the American school system. To that end, she has written curriculum for struggling readers enrolled in both in-school and after-school intervention programs. Mrs. Magit has also been instrumental in writing grants, participating in planning and evaluation of dual language and bilingual programs, establishing Spanish language arts standards for the WIDA consortium and has served on state committees to improve and align the Illinois assessments for ELL students and to write guidelines for ELL students within RtI. She has been a presenter at conferences around the country.